Over the weekend, we had a very special guest! This was Haiden's first time spending the night with us. In fact he spent two nights here while his parents went back to Chicago to meet with the movers. In a few days they'll be moving from their temporary apartment in Columbus into a house. 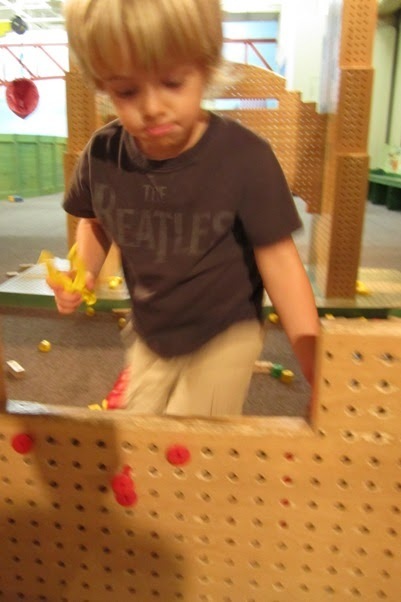 We had so much fun playing games (mainly Batman), building things, going to museums, playing in the yard, eating on the deck, making cookies, and more!! When we played, Haiden was always Batman, but Tom and I never knew which of us would get to be Robin and who had to be the "bad guy". 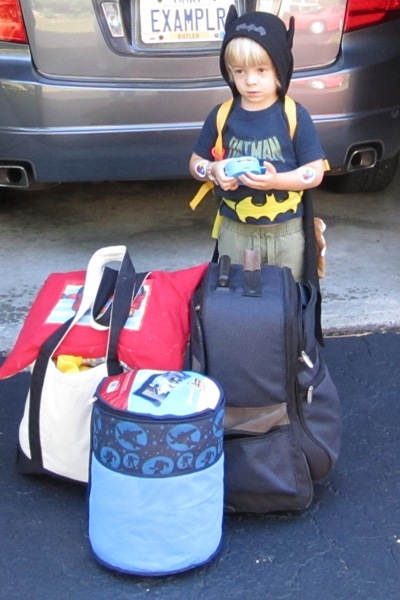 As you can see Batman certainly doesn't travel lightly when he comes for a visit! On our way to the Children's Museum, we stopped to see one of the large squirrel figures in Glendale. 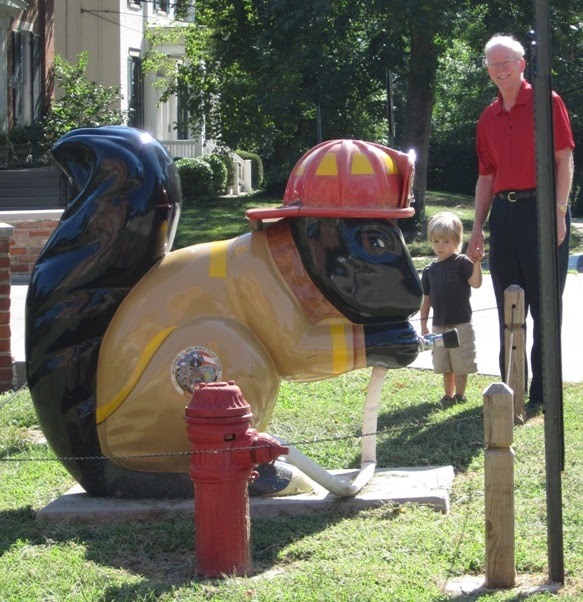 Besides liking Batman, Haiden is also a big fireman fan, so we thought this squirrel would be a big hit. Then it was off to the museum. 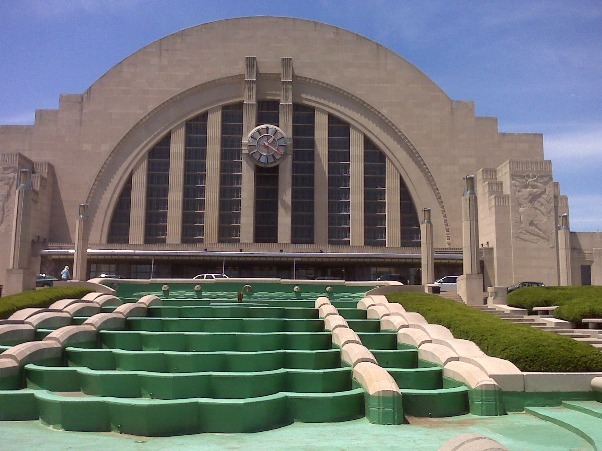 The Children's Museum is just one of the museums in Cincinnati's historic Union Terminal. 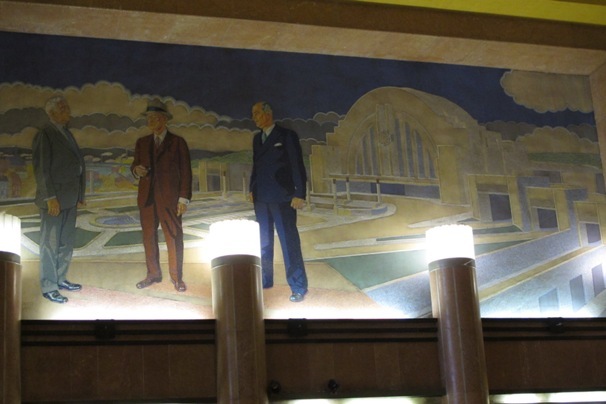 Union Terminal was completed in 1933 as a train station. During World War II, it was a major transfer point for soldiers and served 20,000 passengers a day. However, by the 1950's, railroads in the US were in decline due to the expansion of highway and airline travel. In fact, by 1970 there were only two trains a day, and then in 1972 train service to the terminal stopped completely. 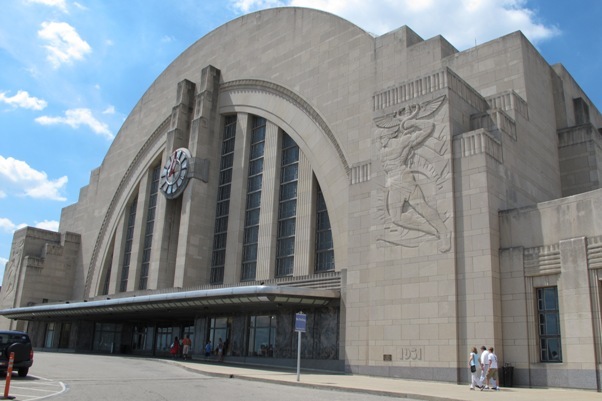 In an attempt to save this historic building, the city of Cincinnati bought Union Terminal and ran advertisements in the Wall Street Journal that read, "World-famous Cincinnati Union Terminal for lease $1 per year." In 1980, the terminal was converted into a shopping mall, but that didn't last long. Again the building sat empty for a couple of years. 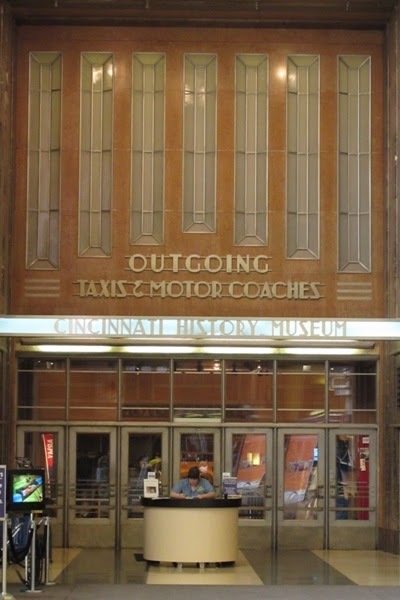 In the mid-1980s, the administrators of the Cincinnati Museum of Natural History and the Cincinnati Historical Society developed plans for a joint museum project in Union Terminal. 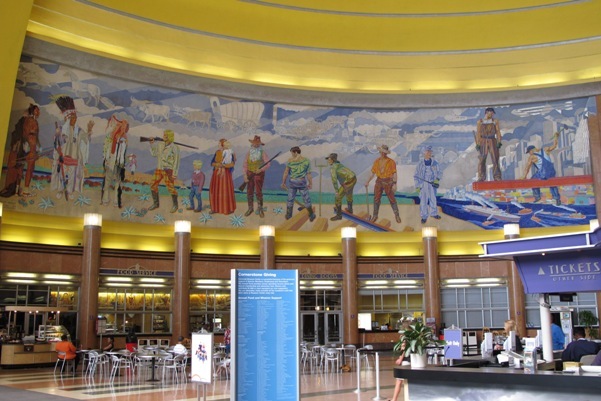 The large size of the terminal and its rich history certainly made this a wonderful idea! Union Terminal then went through massive renovations to restore it to its former glory, and in 1990 it reopened as the Cincinnati Museum Center. The Museum Center has about 1.5 million visitors a year. If you are ever in the area, make sure you check it out. The museums are wonderful and have something for everyone. In addition, just touring the building is a special treat. 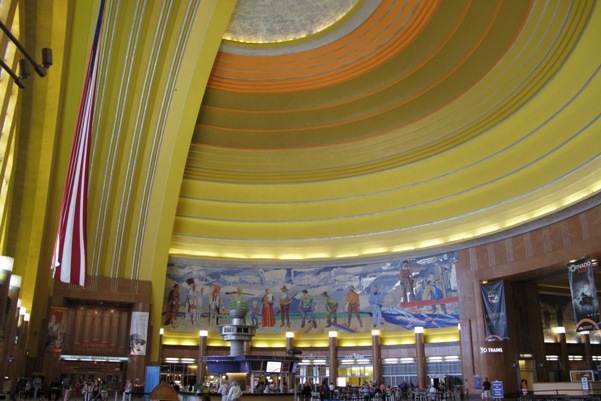 Union Terminal is considered to be one of the best examples in the world of Art Deco architecture. Perhaps you have seen photos of it in books and in magazines. Here are a few photos Tom took of the inside. And here are some more views right inside the front doors of the building. 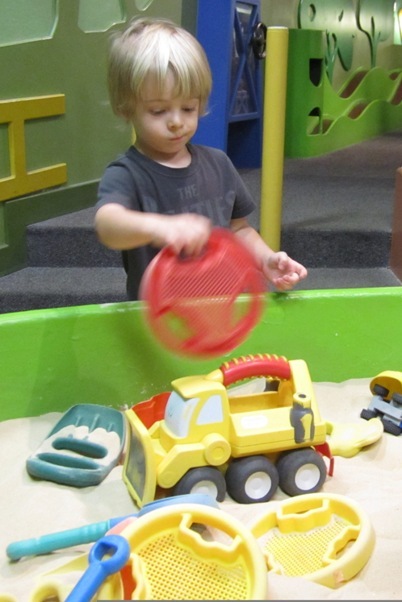 ﻿Of course, Haiden was ready to explore and have a good time! He is in perpetual motion, so it is a real struggle to get a photo of him not moving and looking at the camera. In fact, it is almost impossible. 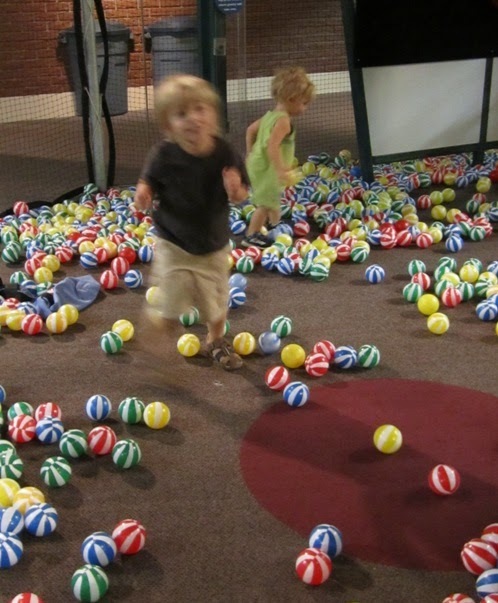 Boy, did he like the ball room! He especially liked it when the balls would drop on his head! I think he'd still be there if we didn't tell him it was time to go. Then to try out the little fire engine. 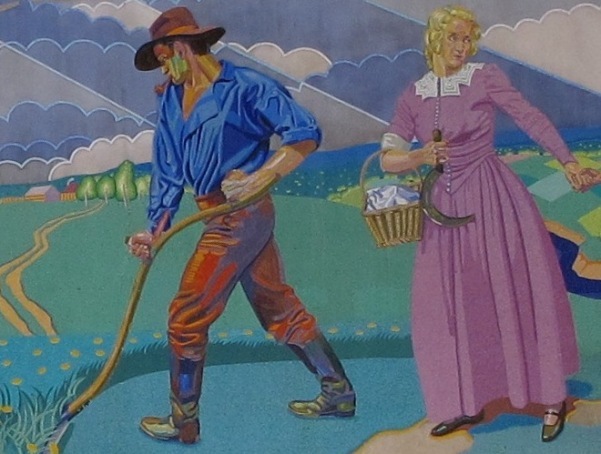 He was no sooner on it, than he was off and on to the next thing. Hmm--perhaps it is time to build something with Grandpa! Hmm--I wonder what else is here to see and do? And then, all too soon, it was time to leave and get someone home for his naptime. 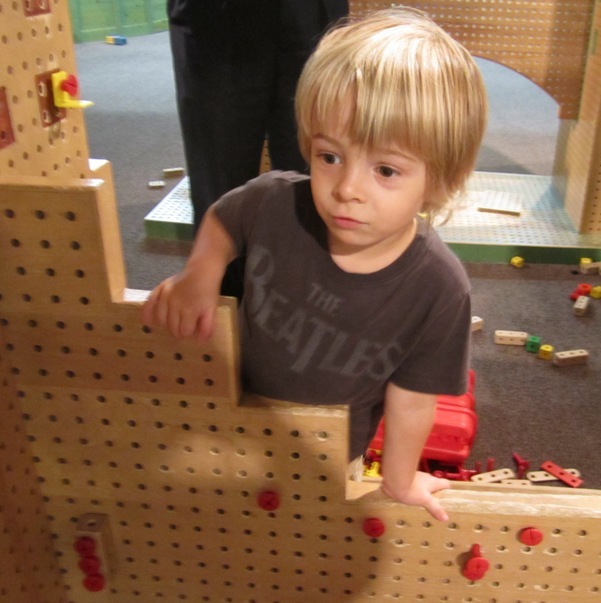 Stayed tuned for Part 2 of Haiden's Cincinnati adventures. I'm glad that you all enjoyed seeing one of my sampler walls in our family room in my last posting. Several of you asked about the names of the samplers. I'll try to get Tom to take a better photo in a day or two, and I'll try to remember the names of the pieces. You can see a few other of our sampler walls by clicking on the words "sampler wall" on the left side bar under "Blog Topics". Looks like a very fun afternoon was spent. Who needed the nap more Batman or Robin? It looks like you all had a lot of fun! Aren't grandchildren just the best? Haiden is a doll. You're not spoiling him are you? 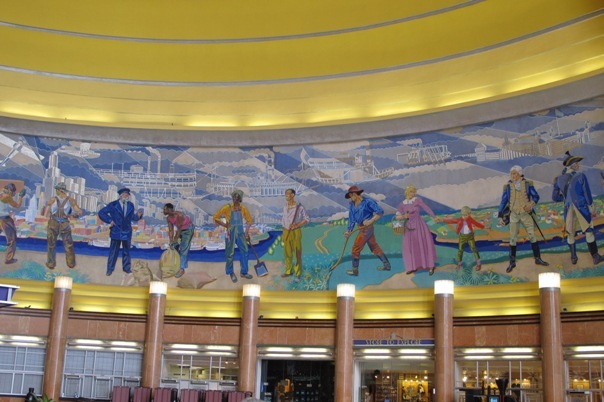 And, what memories you brought back with those pictures of Union Terminal. What an adorable little boy! We are going to visit our Grandson who is now 6,in October. Seeing your pictures makes me anxious! We do the same sort of things with Caleb. Union Terminal looks nice Ellen. Young Batman gets cuter each time you post! Union Station was a great place for a visit. How wonderful for you all. What wonderful memories to have of your time with "batman" over the weekend. I think I would have been tired too, just reading it made me a bit tired. He sure looked like he was having a blast! Those mosaics are amazing!!! Thank you for sharing! Your Batman is very cute! Your little Batman is ADORABLE!!! I have a special place in my heart for the caped crusader, because my son was in LOVE with Batman for a few years, too. His twin sister was Bat Girl, LOL. I enjoyed the pics of Union Station, too, and the history behind it. 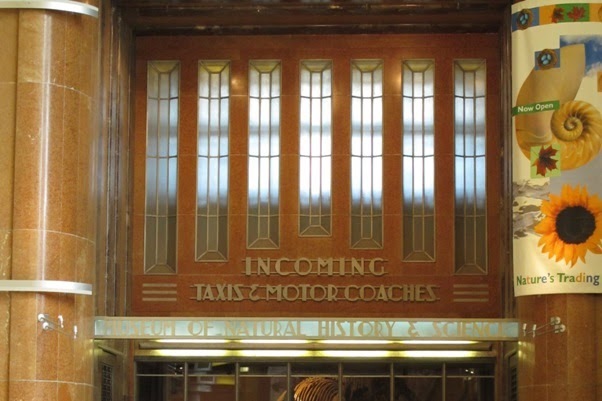 I'm glad that the building was saved--what a treasure!